Climate change and the science of resilience and adaptation are incredibly complex. The Compact has compiled the key resources and experts to help journalists tell what can be a very difficult story to convey to general audiences. The Regional Climate Action Plan (RCAP) is the Compact’s guiding tool for coordinated climate action in Southeast Florida to reduce greenhouse gas emissions and build climate resilience. The RCAP provides a set of recommendations, guidelines for implementation, and shared best practices for local entities to act in-line with the regional agenda. Explore the RCAP here. Released in late 2015, this projection is used by local, county, state and increasingly federal groups working to prepare and protect Southeast Florida. Understanding the projection is critical to telling the story of Southeast Florida and sea level rise. The Compact is an agreement adopted by the Broward, Miami-Dade, Monroe, and Palm Beach County Commissions in January 2010. As the counties recognized Southeast Florida’s vulnerability to the impacts of climate change, they resolved to work collaboratively on mitigation and adaptation strategies across county lines. The Compact represents a new form of regional climate governance designed to allow local governments to set the agenda for adaptation, while providing state and federal agencies with access to technical assistance and support. The Compact has collaborated on activities such as joint policies to influence climate and energy legislation and funding at state and federal levels, developed and implemented the Regional Climate Action Plan, and hosted annual summits to facilitate climate-related collaboration and knowledge sharing. Learn more about the Compact here. How did the Compact start? Representatives of the four County Commissions (Broward, Miami-Dade, Monroe, and Palm Beach) came together at the 2009 Southeast Florida Regional Climate Leadership Summit hosted by Broward County. The representatives discussed regional challenges and threats from global climate change on the over six million residents of the region, and a call to action for regionalized efforts was issued in the form of the Compact. How does the Compact help make a difference today? The Compact is working in uncharted territory with a significant learning curve, yet it is making incredible steps toward engaging local government on a climate action plan that helps the region pull in one direction and speak with one voice when addressing climate change. Adaptation projects are all around us, helping manage the unavoidable. For example, in Miami Beach, entire streets have been redesigned to better adapt to rising sea levels. In Delray Beach, there are duckbill valves which help manage flood waters. In Fort Lauderdale, the sea wall height requirements have been increased. How does sea level rise shape Southeast Florida’s property market? Southeast Florida’s property market continues to be one of the strongest in the U.S.. Each and every day, local governments in South Florida are joining forces to plan and invest in adaptive infrastructure to manage the threats of gradual sea level rise. Those same people working to keep the area safe and enjoyable for millions, continue to live in their own homes. The current efforts put forth to manage the unavoidable threats of climate change in Southeast Florida will help maintain the best of life in the area, and prepare for future growth. How do topics such as climate change and sea level rise play into elections? Sustainable communities require a long-term perspective – one that’s focused on both the present and future, well beyond the next budget or election cycle. It’s essential that elected officials have the same thought-process and work to build and implement plans around climate action that will be carried through the long-term. Is there a unique threat of rising seas in Miami? Sea levels are rising all over the world, threatening low-lying coastal cities, such as those present in Florida. These areas will continue to see the effects of the relatively slow process of sea level rise. In 2010, roughly 100 million people lived in U.S. coastal shoreline counties, with assets, people, economies, and water supplies vulnerable to sea level rise. That’s why local governments are continuously working to find solutions to reduce flooding issues and other impacts of climate change. 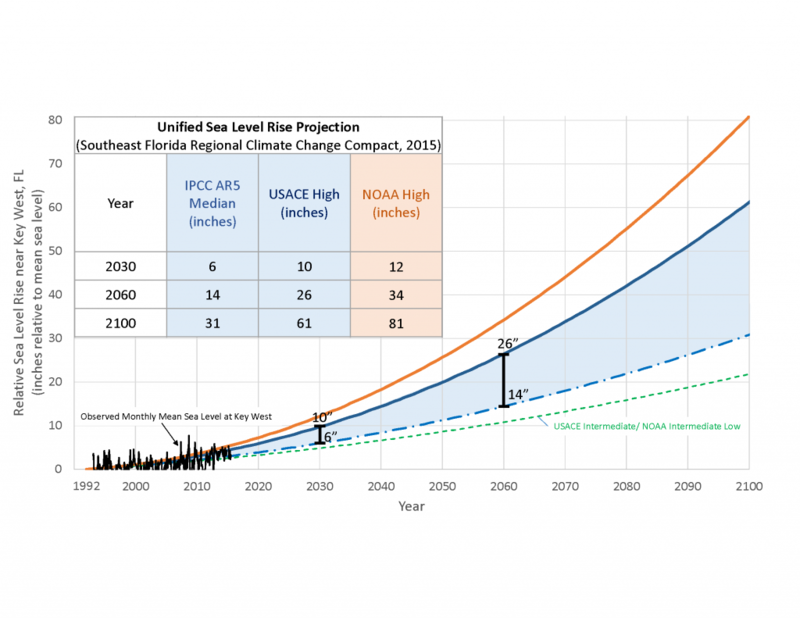 Learn more about the region’s sea level rise projection here. What does the future in Southeast Florida look like? Southeast Florida has a tremendous opportunity to become the “Silicon Valley” of sea level rise with innovative adaptation, academic think-tanks, and best practice examples to share with cities facing the similar challenges. The Compact is dedicated to being a leader in this space, to help shape a livable home for the area’s future generations.